LotRO – Nomadic Gamers, eh! Dora needed some help rounding up her chickens today, so of course I did. She gave me a cloak in return that looked like it had been used to wash the floors, and was no where near as nice as the cloak I was already wearing. Why her chickens were out wandering with wolves, I have no idea, but hopefully she keeps them closer to home in the future. It has been years since I played the Lord of the Rings Online, and even though my other half and I used to play it together for some reason it is one of the very few games that we actually did not return to year after year (unlike EverQuest, or WoW, or EverQuest2). When they announced a legendary server would be opening (much like the progression servers we know at Daybreak) I perked up a little. It didn’t take much hype before I was fully on board and planning out the characters I would play. My husband also decided to play, and though we faced a queue any time we tried to log in we both managed to make new characters – yay! He’s playing a Warden, and I opted to try out a lore-master this time around (the one with the pets). I also have a hunter for ease. Last time we played he stuck to a guardian and I bounced between my rune-keeper and my minstrel. We finished the tutorial starter and headed off to Combe to pick up some crafting vocations. This time around I decided to go Tinkerer, and he went Explorer. It should compliment one another well, and if not no big deal we’re not exactly min-maxers anyway. It’s really nice to be playing again, even if we’re frantically trying to fit those minutes of gameplay in between everything (ie: life). Since we met in a video game (EverQuest 2, for those curious) it seems only fitting. The server has had a lengthly queue every evening, but during the day it’s not too bad. There are all sorts of returning players checking it out, though a fair portion of my twitter friends are reluctant to start on the new legendary server and have opted to remain on the regular servers – nothing wrong with that! I hope this brings the game some money and more business is never a bad thing. We’ll see how long I end up sticking with it. I’m hoping to be able to play a few times a week, even if I don’t get much done. I believe expansions release every 4 months, so there’s plenty of time to catch up to “end game” though I have never actually been end game in LotRO before. There is a first for everything. If there was one game I really wish I had of purchased a lifetime subscription to, it would be the Lord of the Rings Online. I kick myself every time I log in that I didn’t take advantage of it while I had the time, but I just couldn’t afford it. Every so often I get an itch to dive into the game, and this week was no different. I own all of the latest expansions, but my main character is only level 43 (almost 44!) and that’s not high enough to really take advantage of Mirkwood or the most recent expansion, Isengard. Toargo and I delved into game without too many issues, and as a sort of refresher course we decided skirmishes would be the way to go. Great experience, and a safe fighting environment that wouldn’t have other players cursing our name. Most of the time, at least. We completed a handful of them without any issue while I got reacquainted with my Minstrel. Before I knew it two hours had passed and it was time to head to bed. Funny how those moments sneak up on us. LotRO is one of the few MMOs I’ve played for any length of time where I haven’t managed to get to the ‘cap’ in game. In fact I’ve never even been close to maxing out the level of one of my characters. I find leveling quite slow, but then again I don’t dedicate as much time to playing as I do other games either. I’m not quite sure why. The game is (and always has been) breathtakingly beautiful, and I suppose all of the fall colours if Rivendell makes me a little nostalgic since it’s my favorite time of the year. I haven’t subscribed to the game (yet) and am still playing it in the ‘free to play’ form, but I imagine that will change before too long. Where does the time go – I started this blog back in 2006 and have been posting fairly frequently ever since. I’ve met some wonderful people and some not so wonderful people. I’ve shared my experiences with numerous games over that period and I’ve had fun writing ‘my way’ which is typically drama free (and results in less comments but is true to my nature). 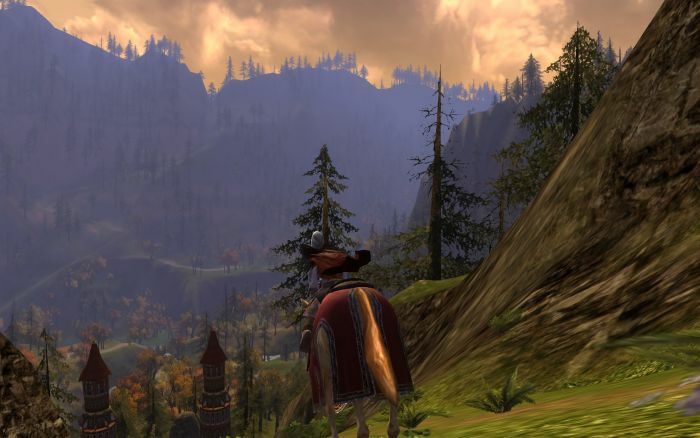 Back in 2006 EQ2 was my game of choice, and while my desire to play it has faded over time I always look at it with fond memories. These days I bounce between a handful of games, at the moment the list includes EQ1, Vanguard, League of Legends, World of Warcraft, Rift, and The Lord of the Rings Online, Sims 3, and whatever else happens to strike my fancy. On the game ‘news’ front this week is pretty exciting. There were test patch notes released for 4.3 (World of Warcraft) and today 1.5 is going live in Rift which is bringing about all sorts of goodies. We’re counting down to the Sims 3 Pets release, and SW:TOR was also given a release date. I’m excited about Skyrim, which is supposed to release November 11th if all goes well. There’s a handful of other notable games releasing over the next few months that I’m sure have people pretty excited. It’s a great time to be a gamer (and a writer of said games). I just want to thank everyone who continues to read this site, and any newcomers. While I write for myself (and always will) it’s incredibly heartwarming to know there are others out there reading about my adventures and sharing in my virtual travels. As always, happy gaming no matter where you find yourself. Hugs! Enough posts of doom and gloom – anyone who has followed me for the past 6 years knows that it’s not my typical style of writing, and I really don’t enjoy it. Today I want to talk about one in-game aspects that I absolutely love and wish more games would incorporate – housing. Out of the games I have played EQ2 and EQ have some of the best player housing. Note that I said of the games I have played because I realize there are a few other older ones that have done it quite well too. I really like the fact that players can “own” a little piece of the game and personalize it; beyond their player characters. Even if you’re not really interested in housing chances are you’ve at least attempted some decor and have a storage space set up. Or gotten a friend to decorate for you. EQ2 and EQ even take this one step further by allowing you to display trophies that you’ve collected in your battles. Turning weapons into house items that can be mounted on the walls. Trophies of raid encounters that you can display in your guild hall. I don’t like LotRO’s housing as much as I do EQ2 and EQ simply because they don’t really let players be creative. They allow you to “hang” furniture on hooks which are set out in specific locations across the house. Sure, it’s customizable in what you actually put in each spot but don’t expect any unique home creations that way. Yesterday I felt the housing bug creep up on me. It’s the one thing that I can’t seem to find in any other game I play to such a satisfying degree. Could I play EQ2 JUST for the housing? That seems a little silly to me. I meandered around EQ1 looking at all of the homes that have gone up since House of Thule has been live. Wow. Some amazing creations by some talented players. I saw everything from wedding chapels to garden gnomes to GIANT garden gnomes. Walled in yards, fountains, a lot of wandering house pets, I saw it all. Couple that player generated content with the books that EQ2 added some time ago and you have yourself one very vibrant role play community. I absolutely love these player written books, I must, since I own over 300 of them written by various authors. We need more of this stuff in our games. That’s what helps separate our Single player RPG’s from the MMO’s and gives them life. First of all, please don’t forget that TOMORROW is the last day I’ll be taking names for the 2010 Gamers Secret Santa. If you want to partake, be sure to email me! Compared to last year this years participation numbers have grown by leaps and bounds and I’m incredibly thankful and excited for everyone who has decided to partake. Now, on to the good stuff! 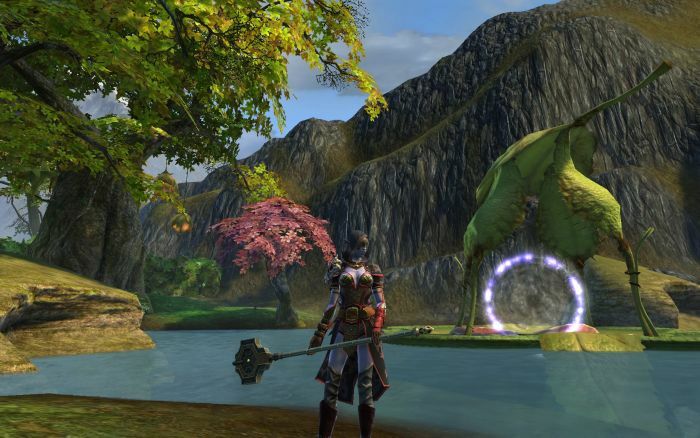 Yesterday was the November update for The Lord of the Rings Online, and what an update it was. I absolutely LOVE the changes to the vault / chest systems. As a crafter and a player with four alts being able to organize my belongings into tabs that I can name is incredibly handy. No, LotRO is not the first game to implement this feature but it’s typically reserved for guild banks (WoW and EQ2 both allow you to name the bank tabs). I now have tabs for crafting raws, recipes, gear, etc. There are 10 tabs in all as well as an ‘all’ tab that allows you to scroll through each of your named compartments. I spent an hour organizing each character as well as my shared vault. The changes to crafting I could go either way on. Number one the UI is HUGE. It actually blocks too much of my screen when I am on my farmer and I have to adjust it in order to harvest from the fields below me. I also do not enjoy the fact that VIP’s who are already paying to play the game are bombarded with the store screen at every possibility. I understand that the company is there to make money, but if a player is already making those purchases I’d love to see them exempt. More motivation to become a VIP and all that. I do like the double layout, so that I can see my crafting recipe list at the same time that I can see what those recipes make. I just wish it were smaller. I realize you can shrink your UI down but it’s just this one aspect in particular that I find gigantic. Tasks. I was disappointed with the task system. You will find bulletin boards all through towns, typically level appropriate. If you can interact with it you’ll see a quest ring icon on your mini map and the base of the bulletin board will also sparkle. You must be within 4 levels in order to accept tasks from one, and as has already been stated the jist of it is to pass over your vendor fodder in exchange for xp and faction. Except in my humble opinion, it’s completely not worth it. At level 42 I received barely 1,000 xp – which is pretty much nothing when I gain 6,000 xp for doing some quests. 4,000 xp for doing a skirmish daily. You gain 300 faction which IS very nice but not at the cost of losing your vendor fodder. You can only do 5 tasks a day, and if you want to do more you have to pay 50 turbine points each time to refresh them, for a max of 5 times refreshed (granting you 30 tasks a day). I like the fact that you are unable to simply purchase items from the broker in order to level up – but on that same hand find the rewards a little lacking. Another issue is that the boards do not tell you what level ranges they provide tasks for, and you need to be within 4 levels in order to accept them. At level 40 and 42 none of my characters were able to accept tasks from Rivendell, although they were able to get them from the camp in Misty Mountains. The barter wallet is there but again lacking. While most of my skirmish tokens were automatically added, none of my fall festival tokens were inside the wallet, nor were some of my other tokens. This is a great idea in concept but I wish they had of refined it a little before adding it to the game. There were numerous other changes that took place as well, but those are the ones I had that directly affected my characters. Has anyone else explored the November Update yet? What are your thoughts on the changes? It seems to be the time of year where we’re all waiting for things in our various games. The only exception (for me personally) at this time is EQ2, which has been abysmally quiet. The server merges have not taken place and aside from the push of the market place there wasn’t even a celebration in game for Thanksgiving. I suppose technically we are waiting on Frostfell to begin, but since this is a typical in game holiday I’m going to exclude it from the list. So. What are we waiting for? LotRO – the November update which is (I believe) scheduled to take place today. This is going to introduce tasks, a whole slew of crafting changes (including farming), a barter wallet, class consumables, new mounts, new dye, and numerous other changes and goodies for players. Personally, I’m excited. I’m not a fan of the new shop window that will appear in the crafting panel and I’m not fond of how games are pushing their stores towards players who already pay the monthly subscription fee (it should be omitted if you have a subscription imo) but in F2P games this seems to be the new norm. EVE – Incursion. While the really cool bits like the new character creator and sansha incursions won’t begin until January 2011, there are changes happening before then as well. (Scheduled at this time for November 30th). The learning skills are being removed and any points you’ve spent towards them are being reimbursed. There are new story line courier missions. There are numerous UI changes, camera changes, and ammo changes. New ships are being added. There is another patch coming just before Christmas which has very little details, and then the major incursion changes in January. Excited? Of course! WoW – Cataclysm. Releasing December 7th we have already been privy to a whole bunch of changes. It would be impossible for me to list them all but a few that stand out are the class / race combo changes, hunters being able to tame foxes, lower level dungeons having the quest NPC’s added to the actual zones instead of you having to track them all down, of course there are the actual zone changes with the Shattering. Living through a cataclysm is great. It’s certainly not the first time one has taken place, but I do enjoy the entire world changing. There were new factions added and players have been busy dungeon grinding to raise them up. With those new factions came new mounts, and lets not forget the awesome Plants vs. Zombie tribute sunflower pet where you actually have to play a version of plants and zombies in game. Wizard 101 – Gardening. Tipa has been posting her progress on the test server and I have to admit, it looks like fun. While I don’t play wizard 101 nearly as often as I’d like, I’m still a fan of the game and its unique combat style. I love seeing these types of updates, and I’m interested in diving right in and starting my own garden. I still haven’t even checked out Celestia, or any of the worlds after Krokotopia (Marleybone, Mooshu, Dragonspyre) but that is more of a lack of time then anything else. The holidays are just around the corner and most of these games will also be adding some sort of winter update (including pretty much every single other MMO out there). I tend to avoid the real life holiday crowds as much as I can (I was diagnosed with agoraphobia and it makes things difficult) and look forward to partaking in these virtual celebrations. Of course much of the month will also be taken up with family festivities so you may see a dip in posts, but I’ll do my best. November brings a lot of changes. Not only do clocks go back, winter rushes in, and I of course pick up yet another cold – but in LotRO there are alos a lot of really neat changes being implemented. I’m pretty dang excited. The barter wallet – It’s still in the early stages, but much like EQ2’s currency window that was added last month, this will store all types of skirmish marks and anniversary tokens. There is also word of it expanding to all barter items in the future, but for now I’m happy that I’ll be able to free up some much needed inventory space. Crafting changes – While personally I’m not pleased (nor will I be taking advantage of) the fact that you can buy your way through craft experience via the LotRO store I AM excited about the other changes. The entire crafting window has been re-designed, allowing you to view recipes on the left and the craft window on the right. The changes to the store include not only xp but crafting ingredients. This may sound like a horrible idea especially if you don’t have the money to spend on turbine points – but for me personally, I’ve just stopped being preoccupied with what everyone ELSE is doing. If I don’t want to purchase my way to end game and would rather earn it, then that is how I’ll do things and I’ll take pride in that. How everyone else decides to level up has no baring on me and my play style. More power to them. Farming is also changing. You’ll gain back a whole lot of inventory space (woohoo) and it’s been simplified. Seed count has gone down, among other things. Class consumables – Unlike food, tokens, and potions these will be exactly as they sound, consumables that give bonuses specific to your class. They are both crafted and available in the store. It should be noted that while you CAN purchase items in the store, the crafted version is almost always better. You’re not forced to use the store. New Dyes – Scholar made, there are 10 new dyes for cosmetics being added. New Mounts – These are new reputation and meta-reputation mounts being added, and they’re REALLY nice looking. Since earning reputation is such a big deal in LotRO, I’m really looking forward to these. There are other changes happening but those are the basics. My Minstrel reached 41 last night and spent a good deal of time working on older (ie: faction) quests and working on mastering expert tailoring / metalsmithing (which I completed). The important part is I’m really having a blast in game, and I’m excited about future levels. Happy gaming no matter where you find yourself! I finally mastered expert tailoring and metalsmithing. I’m caught up (some what) with my crafting now, working on the first round of artisan (T4) before also attempting to master that. Prospecting is going well and I’m on T5, harvesting being far easier to work up (or so it seems to me at least). I’m just a little bit away from level 41, and instead of making any real progress on the epic ‘book’ chain I decided it was time Toargo and I worked on clearing out some of those older quests from our journal. We headed back to the Trollshaws and even though we may not have gotten a lot of experience or upgraded gear we did get a lot of faction and coin from completing those quests. Faction (as I am learning) is quite important in LotRO. Problem is I’ve been out leveling my quests and haven’t been working on faction in a very dedicated manor, so while I am Ally with a few, I’m not Kindred with anyone. In fact knowing me, the first people I’ll become kindred with will be my tailors guild, hehe. Those creatures pictured above are my new favorite things. I just LOVE the colours – I want one for a pet. My apologies again for a lack of substantial posts this month, but with real life and NaNoWriMo taking up 99% of my days there’s not a whole lot I can do about it quite yet. Safe travels, no matter where you find yourself! I have to admit, reaching level 40 was a little bit of a let down. I purchased one new skill and then set off for the skirmish vendors who sold me a handful of gear upgrades (my cheapest method of obtaining new gear) – and that was it. I had been looking forward to something more, I have no idea what it was but I didn’t feel satisfied. This weekend was spent avoiding NaNoWriMo and taking care of some real life things instead of delving too much in game. I did work on my crafting for a good portion of yesterday evening and I’ve finally almost mastered expert (T3). Then it’s on to artisan. Each tier you master requires more points to master the next one, I think I’m up to 720 so far and I’m not looking forward to the amount of supplies artisan is going to require. Thankfully crafting (and harvesting) is not difficult per say – and I had a nice relaxing time of it. I’m also really enjoying the Misty Mountains which is where I’m questing now. I have a thing for snow capped zones (it’s already so close to Christmas, I’m so excited) so the zone itself appeals to me on very basic levels. What didn’t appeal to me was the group of players who decided to rush past me on their mounts to kill ahead of me including the mob I was after. Ah well, when situations like that occur I typically just think that they must need it a lot more then I do (because I wouldn’t be as rude as that) and I let them have it. I don’t mind waiting for it to respawn. I’m looking forward to delving into more content, and maybe even eventually reaching Moria and beyond. We’ll just have to see how it goes!